Sam’s Bar-B-Que, in San Jose, introduced me to my first Cowboy steak. My daughters go to a swim school next door and you can always smell the delicious BBQ smoke in the air all day long. In front of Sam’s, a big A-frame sign advertises Bone-In Cowboy Rib-eye Steak. 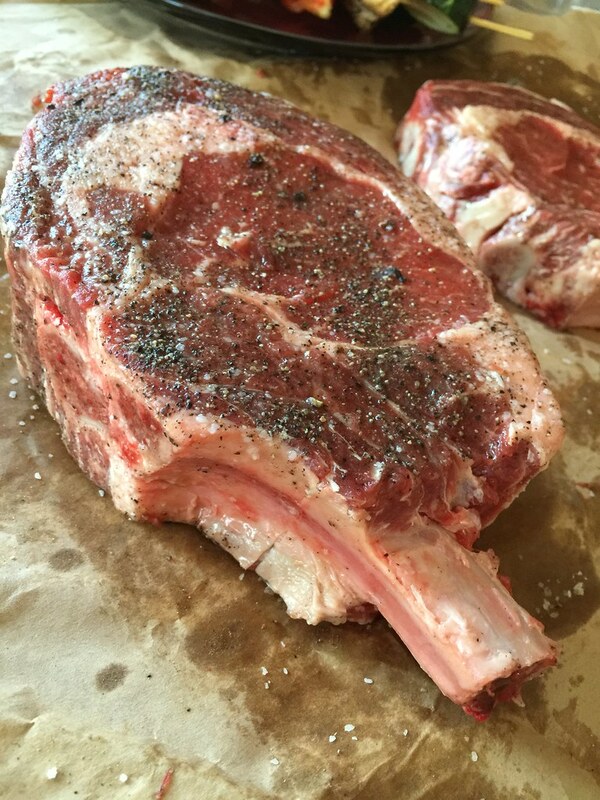 Curious, I Google’ed Cowboy Steak and found out that it’s a big and thick, 2+ pound, bone-in ribeye steak…MAN, that got me excited and couldn’t wait to try it. 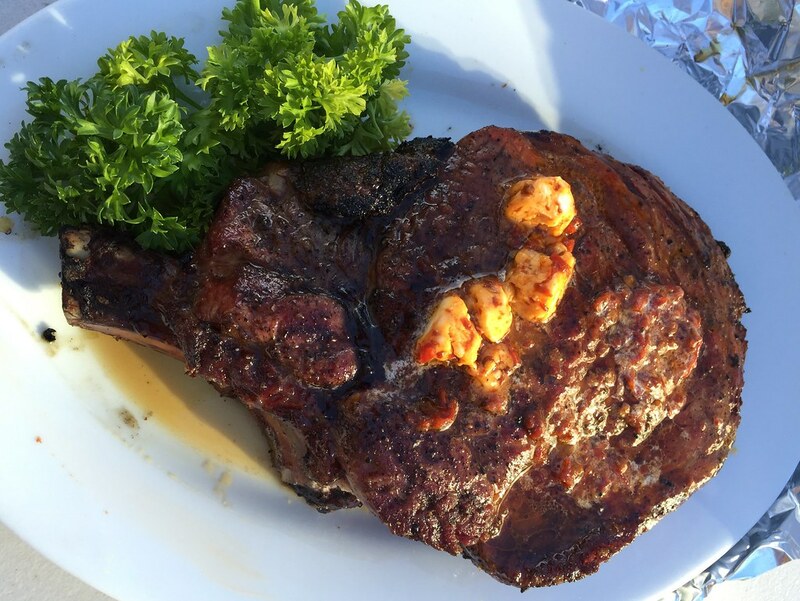 So when my buddy celebrated his birthday at Sam’s Bar-B-Que last January, I was able to finally order my first Cowboy steak. The meat is super juicy, fatty, and flavorful. It was so big that even my wife and I couldn’t finish one steak. Incredible. I found Cowboy steaks at Nob Hill Food and tried to replicate it the same way I had it at Sam’s Bar-B-Que. 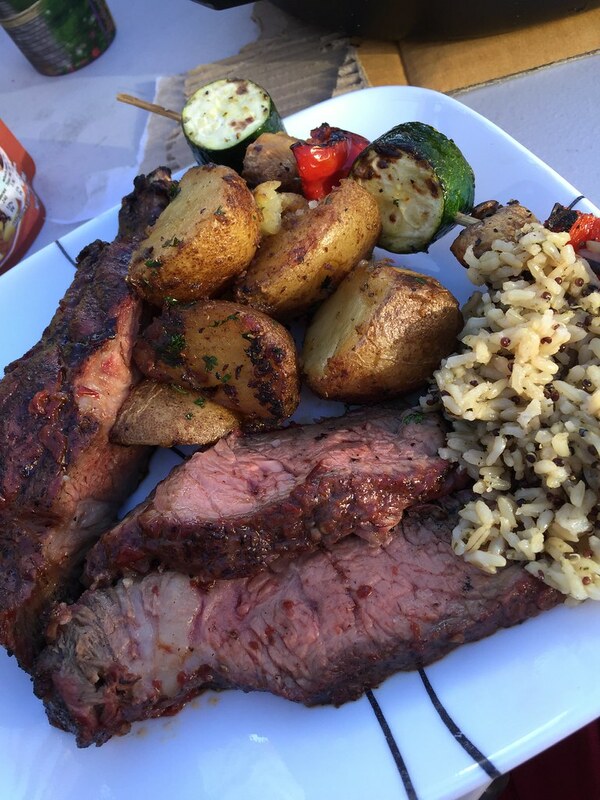 I added some melted Chipotle butter to enhance the steak flavor and give it a spicy kick. To cook the Cowboy Steak, I used the “Reverse Sear” method. 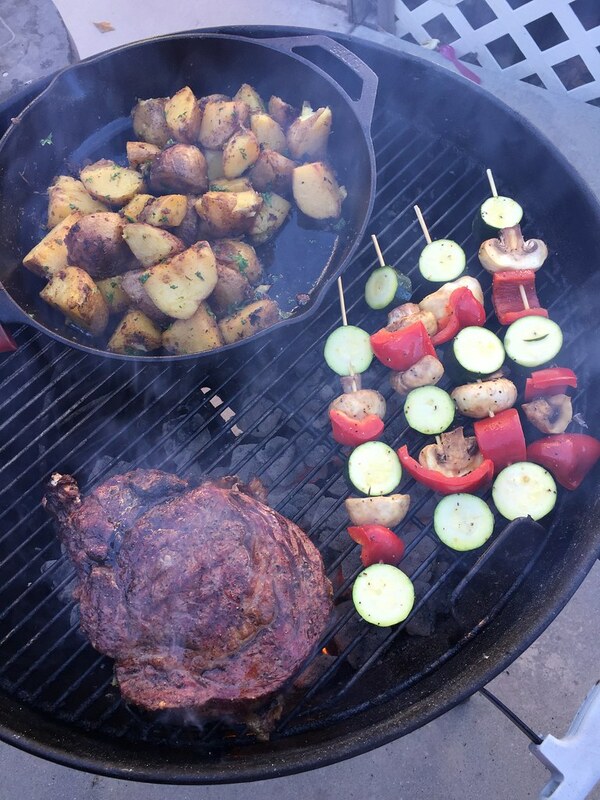 I started by cooking the steak on indirect heat for about 20-25 minutes or until the steak reached 140 degrees (my wife and I like medium), then finished cooking the steak by searing over direct heat for 2 minutes per side. 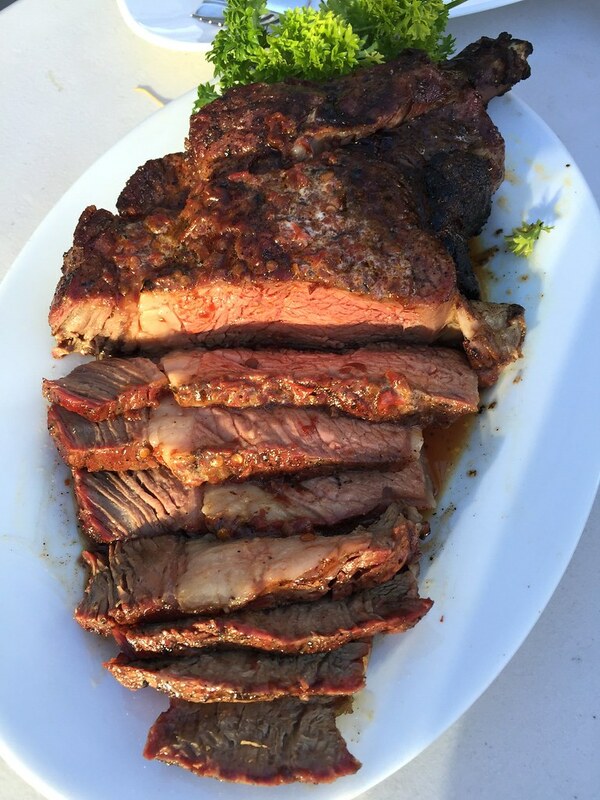 I read many blogs and this is a great method to cook the Cowboy steak or thicker cuts of meat because it makes the steak juicier and more tender, and infuses more fantastic smoke flavor into the steak. Prepare Steak: Drizzle oil on steak, rub gently. Season steak liberally with kosher salt and pepper. Let steak rest and bring to room temperature. Prepare Chipotle Compound Butter: Add butter and chipotle peppers to a medium sized bowl. Using a rubber spatula or hands, mix until well combined. 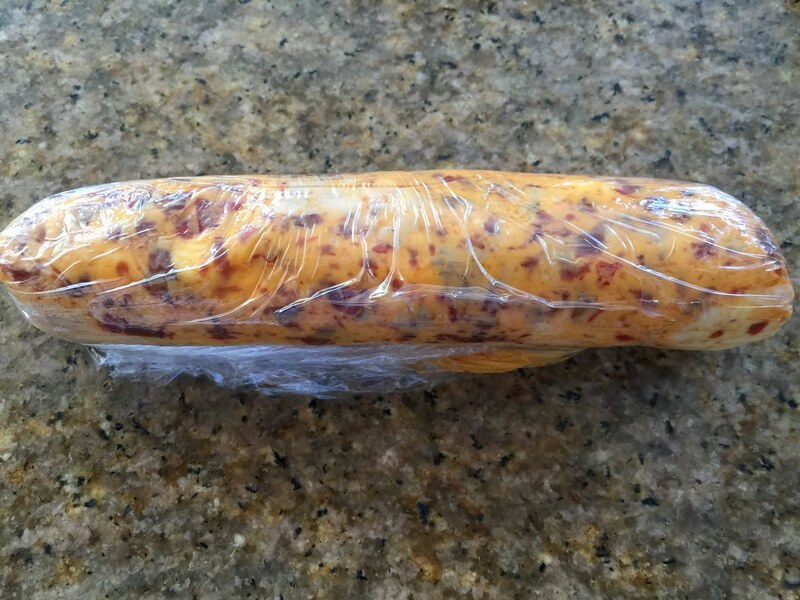 Tear a piece of plastic wrap, put mixed butter on the plastic wrap, and roll it tightly into a log. Refrigerate for at least 2 hours. Grill Steaks: Set up two-zone fire on the grill for indirect grilling. Clean grate and then oil the grate. Place steak over the indirect heat, cover grill with the lid with vent holes fully opened over steak for about 20 minutes or until the internal temperature of the steak reaches 140 degrees (or desired temperature). Sear steak on each side on the direct heat for 2 minutes per side. Remove steak from the grill, put a few slices of chipotle butter on top of the steak, cover with foil, and let rest for 10 minutes. Once steak is rested, slice and serve with your favorite carbs and veggies. Resting steak after grilling allows the juices to redistribute into the meat. This makes it juicy! As mentioned, the Reverse Sear method works great for thicker cut of meats such as Cowboy Steak, pork chops, and Tri-tip steaks. The steak is thick so season it liberally!